If the town of Maggie Valley in the Blue Ridge Mountains of North Carolina sounds familiar, it’s probably because you’ve heard of its most famous resident, Dale Walksler, and the Wheels Through Time Museum he owns. Dale and his museum have been featured on just about every form of media out there, from reality TV to print magazines, and just one step inside will show you why. With more than 350 running machines, predominately American-made motorcycles, Wheels Through Time is a treat whether you are a diehard motor head or just a student of history. Covering the staggering breadth of machines housed at Wheels Through Time would be better served by a full-length book than by an online article. So I’m going to take a different approach and pick out five of my personal favorites. Then you should go see the rest yourself. A 1942 U.S. Air Force-owned Harley-Davidson WLA. Photo by Panhead Jim. As you enter the museum, one of the first sections you pass is the military exhibit. While it is has a number of the OD green machines you would expect, what stands out right away is a trio of white Harley-Davidson motorcycles. Closer inspection reveals that these three motorcycles are the ubiquitous WLA models that Harley produced for the U,S. Army and the Allies during WWII. An estimated 80,000 rolled out of the factory in Milwaukee. WLAs used a special air cleaner to help protect the engine from the harsh environments they regularly rode through. A secondary battery was also added to the rear of the machine. Photo by Panhead Jim. The WLA was a real workhorse during the war. Powered by a 45 ci side-valve V-twin motor mated to a three-speed transmission, it rumbled its way all across Europe, leading convoys and running dispatches. What is unusual about these three is not that they are painted white, but that they were property of the U.S. Air Force. Most motorcycle historians would tell you that only the Army used the WLA. Actually, that’s how these machines came to be part of the Air Force. If you remember your U.S. history, the Air Force was initially part of the Army, first known as the Army Air Corps. So when these machines were picked up by the Army Air Corps in 1945, they were still technically part of the Army. When the Air Force was officially formed in 1947, these Harleys “reenlisted” with the Air Force and were used to patrol the Tinker Air Force Base in Oklahoma. The 1937 Harley-Davidson UMG was H-D’s best attempt at cloning an Indian motorcycle for the New York Police Department. Photo by Panhead Jim. The right shift configuration was also an option available to the general public, as Harley was always looking for Indian converts. Indian, in turn, did the same, offering left shift configurations for Harley converts. Photo by Panhead Jim. Harley-Davidson and Indian were known for the fierce rivalry on the race tracks, but they also competed just as fiercely for commercial sales, especially the lucrative contracts with state and local police departments. Since 1911, Indian had been the sole supplier of motorcycles to the New York Police Department and Harley was willing to do just about anything to break that monopoly, even if that meant copying their longtime rival. The result was the UMG, which is as close to an Indian as a motorcycle can get while still being a Harley. The UMG was based around a U-series motorcycle, which used a 74 ci side-valve V-twin mated to a three-speed transmission. In order to meet the specifications laid out by the NYPD, the UMG’s controls were configured just like an Indian. This meant that the hand shifter was moved to the right side, along with the front brake lever, the throttle was moved to the left handgrip and the timing advance was moved to the right handgrip. Also, the standard battery/generator set up was replaced with a magneto/generator. To top it all off, the tins were painted a shade of red very similar to that used by Indian. In all, an estimated 400 UMGs were produced, but even with all the changes they failed to sway the NYPD. The 1933 Woolery Bullet, Harley’s first factory custom. Photo by Panhead Jim. The DL motor was nicknamed the “three-cylinder Harley” due to its vertically mounted generator. Photo by Panhead Jim. In recent times, Harley-Davidson has thrown around the term “factory custom” every time they come out with a new model made by combining parts from a couple of previous models and adding some flashy new tank badges. Turn the clock back to the early 1930s, and Harley-Davidson was struggling to make it out of the Great Depression and was so desperate to sell motorcycles that they created this one-off machine, which was the first motorcycle to roll out of Milwaukee that didn’t bear the name “Harley-Davidson” on the gas tanks. At the request of the customer, this motorcycle was christened the “Woolery Bullet” and the name was painted onto the new art deco logo in place of HD. Just like its modern-day counterparts, the Woolery Bullet is a combination of parts from previous models. The motor is 1931 45 ci side-valve V-twin known as a DL. This is mated to a hand-shifted three-speed transmission and the entire drive train is mounted in a frame intended for a single-cylinder model B. The combination of a lightweight frame and motor resulted in a recorded speed of 88 mph, which is not bad for a machine that produced under 25 horsepower. 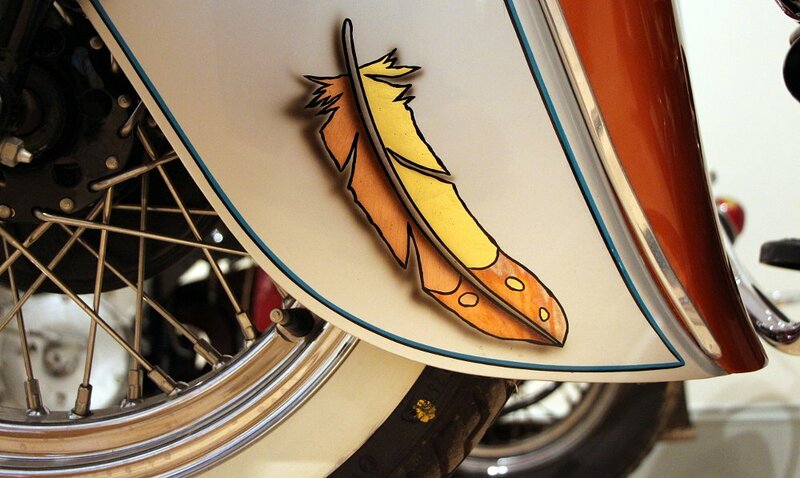 This 1938 Indian has seen a lot of hard miles competing in the numerous endurance races. Photo by Panhead Jim. Before the production of dedicated off-road motorcycles, those who wanted to compete in enduro competitions only had the option of modifying street motorcycles into more capable machines. One of the most important and famous enduro races in the country, the Jack Pine Endurance Run, started in 1923 in Michigan. This three-day race covered more than 800 miles through the back country of Michigan. A snorkel runs through the gas tank and exits under the speedometer, to keep water out of the carburetor when making water crossings. Photo by Panhead Jim. The machines and riders that took on this challenge were definitely a special breed and the modifications to this machine are some of the most interesting I have ever seen. Just the motorcycle itself is awesome because it is a rare Indian four-cylinder, but the changes made to adapt it to the harsh reality of riding over rough terrain, fording rivers and climbing hills are nothing short of ingenious. The engine features several interesting modifications, including a carburetor that uses a snorkel to allow the motorcycle to travel partially submerged in water. The attached sidecar not only carries extra fuel and a passenger, but also features a driven wheel that can be manually engaged and disengaged. If two-wheel-drive is not enough to keep the motorcycle from getting stuck, there is also a winch powered off the motor that can pull the motorcycle out. The 1920 Indian Daytona with a Flxi sidecar was hard to beat in the 1910s and 1920s. Photo by Panhead Jim. In the 1910s and 1920s, sidecar racing was a popular event on dirt tracks all across the United States. Just like many early forms of motorcycle racing, it was extremely dangerous for both the riders and oftentimes the spectators, as the motorcycles could easily run off the track and into the audience. This actually led to a complete ban on the sport in the mid 1920s. The large number of wrecks also meant that few race bikes survived the era and even fewer with attached sidecars. What makes this machine even more rare is that it uses an unusual sidecar produced by the Flxi company that could lean with the motorcycle, giving it a distinct advantage over rigid-mounted sidecars. In fact, in the summer of 1921, all sidecar races in the United States were won with machines using Flxi sidecars. Close up of the “flexible” attachment point between the sidecar and the motorcycle. Photo by Panhead Jim. Invented by Hugo Young in 1912, the Flxi sidecar combined flexible connections between the sidecar and motorcycle with a tilting wheel, which acted much in the same way as independent suspension on a modern automobile. Pairing the Flxi sidecar with a 1920 Indian made for a potent combination as the big-valve 61 ci IOE V-twin that powered the motorcycle was quite powerful. Piloted by Cliff Dreyer in the 1910s and 1920s, this machine once held almost every sidecar dirt track record. Overhead view of one of the full-size motorcycle shops reconstructed inside the museum. Photo by Panhead Jim. That’s just a peek at some of the great machines that are part of the Wheels Through Time collection. There are more than 300 motorcycles, as well as automobiles, memorabilia and even full-sized motorcycle shops reconstructed inside the walls of the museum. You really need to see it with your own eyes to fully appreciate the amount of motorcycle history housed under one roof. Unlike most museums, which block off their exhibits with glass cases and velvet ropes, Wheels Through Time has all its machines readily accessible to its patrons and Dale can be seen routinely starting rare antique machines throughout the day. Also make sure you purchase a ticket or 10 for the annual motorcycle raffle. 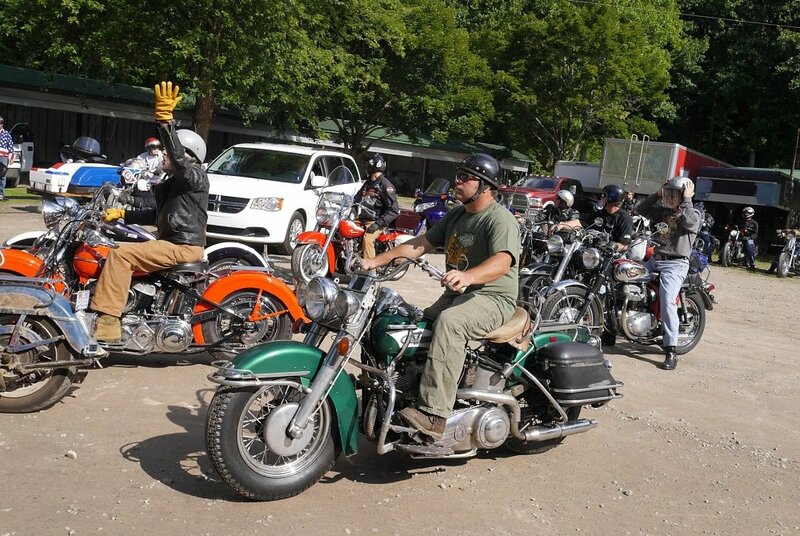 This year, Dale will be giving away a 1948 Harley-Davidson Panhead that he has brought back to its original glory. 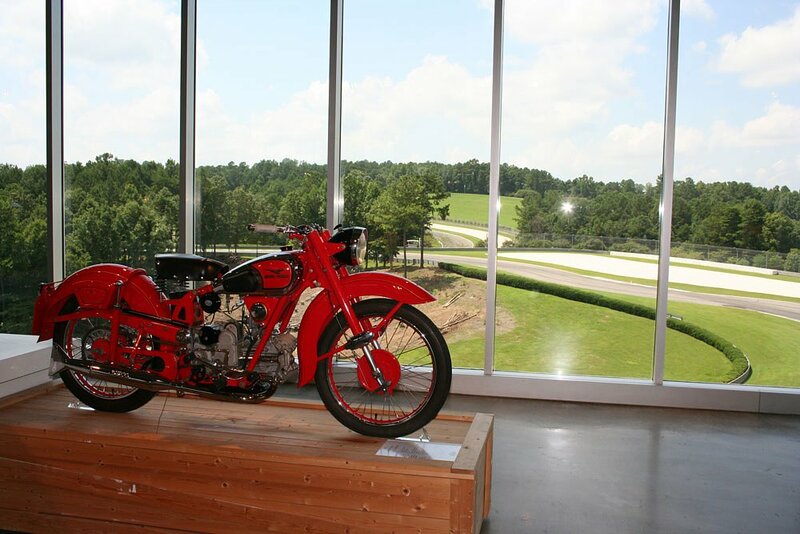 Each year, the museum raffles off a vintage motorcycle personally restored by Dale Walksler. For 2016, he built this red 1946 Harley-Davidson Knucklehead. Photo by Panhead Jim. The museum just closed for the winter, but will reopen April 1 next year. Start planning your trip down to western North Carolina.